Heat olive oil in a large heavy saucepan over medium heat. Sauté shallots until softened. Stir in onion and pancetta, and cook until bacon is evenly browned. Stir in garlic when pancetta is about half done. Remove from heat. Bring a large pot of lightly salted water to a boil. Add pasta and cook for 8 to 10 minutes or until al dente. Drain pasta, and then return it to the pot. In a medium bowl, whisk together egg yolks, cream, lemon juice and shredded Parmesan. 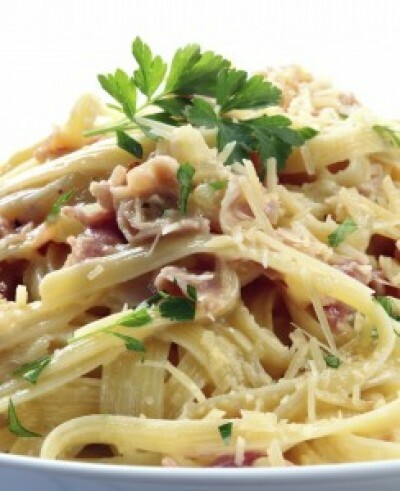 Pour the bacon mixture over the pasta, and then stir in the cream mixture. Season with salt and pepper. NOTE: I sometimes add grilled shrimp or my favorite PEAS to my carbonara!